"Introduction to the Momentum Version 4.2.3 Strategy"
Welcome to the Momentum EA version 4.2.3. This version works exclusively on the EURO/USD(very liquid market) and the four hour time frame and will trade around fifty times per year. The objective of the EA is to capture as much as possible of any momentum move and to always be aware of potential reversals. The EA will wait patiently for the right move to occur and then jump in to capture that move. The EA is designed to take advantage of the excellent liquidity available in the EUR/USD and it is advisable to run the EA on a VPS machine to obtian the earliest entry and in order to capture every pip of the move. If you are new to FX, then please drop me a line using the help desk on the main menu, in order to discuss this EA and for any further explanations should you need them. Most people over egg their expectations in respect of automated trading, as they believe the hype and 'leverage talk' pushed out by the brokers and as a result, expect hundreds of percent profit per year, per EA that they run. Whilst nothing is impossible - especially in FX - the chances of maintaining these types of percentages over the long term are quite slim and attempting to find out if you can do it will normally result in one or more blown accounts. This is not the way I trade. Nobody should be risking their account by over leveraging their automated trading, it isn't necessary to do so in order to become profitable. If you follow some simple and logical ideas, you will better understand, that you have more chance of an overall higher percentage increase in your account by trading multiple EA's for lower percentage gains per EA. That is what automated FX trading is all about. Using automation to diversify and create a portfolio of winning strategies with low level % gains per EA, which total up to very respectful gains. Please don't be taken in by the sales pages out there which promote EA's that make 2000% per year, think about the most successful Hedge Fund managers on the planet who make around 30% a year on a good year. 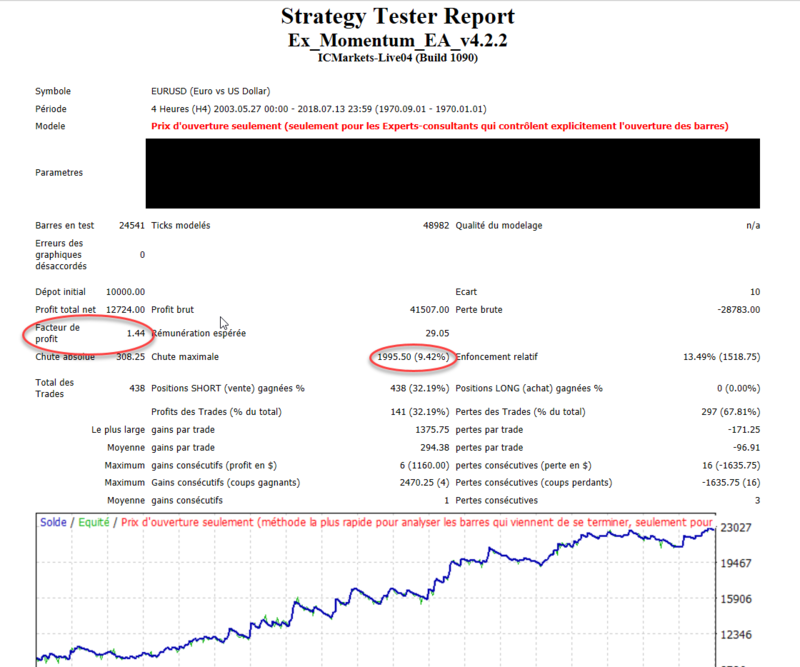 Here are the results of the Momentum 4.2.3 EA which is running off my LIVE EUR Account at ICM and is posted to MyFxBook. The go-live date of the account was the 23rd July 2018. Creating a winning EA is not easy, for every ten EA's that I create, around eight of them go straight into the bin or are put to one side, as they do not stand up to scrutiny when put under pressure during testing. Below, I have listed some of the reasons why this is a solid EA and should continue to prove itself over the long run. Runs only when the most extreme momentum is present and captures what is available in terms of price increase. Not affected by sideways activity or whipsaws as stays out of the market during such times. What will I receive if I purchase the Momentum version 4.2.3 EA? The Momentum 4.2.3 Expert Advisor which is suitable for running on your brokers Metatrader platform or via a VPS machine. What about if I'm new to trading or automated trading? If you are new to trading this is not an issue, as I will be presenting things in a very easy to understand no-nonense style within my documentation andI am here to help if you ANY questions. Absolutely, just purchase from this landing page by clicking in the 'Purchase Now' button below. What are the next steps how can I get going ? Simply finish reading this page and click the purchase now button, this will take you to the PAYPAL page awhere you can once, once payment is received you will be redirected to the Exact Trading Momentum 4.2.3 strategy sign up page which will allow to receive the EA and documentation. Can you let me see an example of the type of profit it is possible to make with an FX algo? Yes for sure, just look on this page at some of the examples. Can anyone become an automated FX trader? Yes, anyone can learn the skills necessary to set things up the way they need to be, to guarentee sucess. Obviously the EA will do the work, you just need to set up your Metatrader platform correctly and set up the parameters which i will give you correctly. In addition, because this EA trades very fast momentum moves I suggest running a VPS machine located in the same cage as your brokers server. How much money you bring to the table will dictate how much money you can generate as income. My own strategies look to trade very conservatively. The idea should be to mix and match multiple strategies to create a portfolio. Remember 30% from a handful of strategies combined per year is huge compared to what you can earn on a bank deposit account. The amount of money you put in your trading account. The performance of the EA. The EA under a testing period of fifteen years has shown a return of 20% during the testing period with a drawdown of 8% and leverage of around 1 to 5. Reduce the leverage and this will reduce the drawdown and but reduce the profit. I am personally running this EA within a basket of others and looking for a profit of around 5 to 8% per year with a similar level of drawdown. Examples Of How The Momentum Version 4.2.3 EA has Performed in the Past? 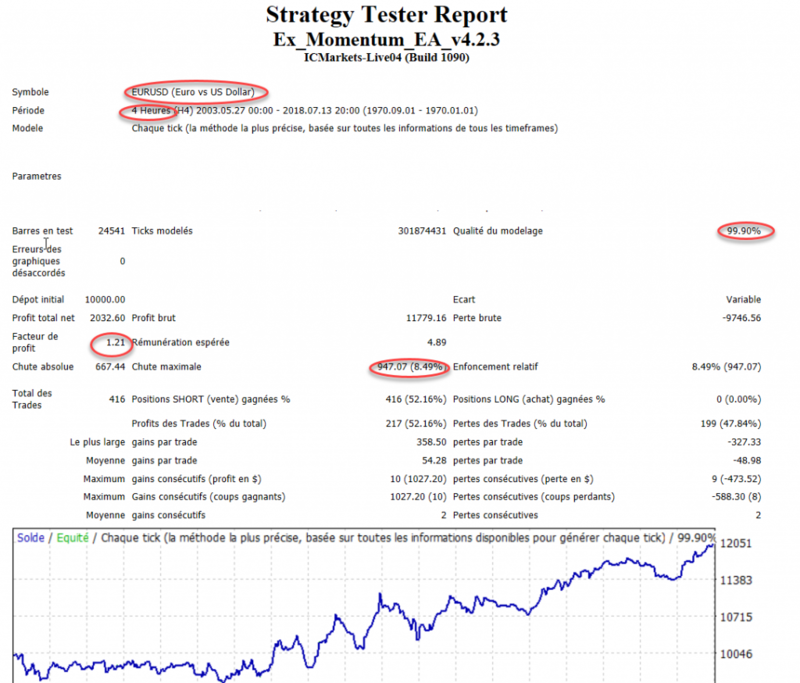 There is a lot to learn about FX automated trading strategies. One of the most over looked is to create a method which provides a curve which is realistic but has faults. Now, to most FX traders this might sound somewhat suspect a trading strategy which has 'faults'. What I mean by this, is that a curve where "everyone is at" and which resembles a straight 45 degree line, will almost certainly fail as the big money will sooner or later find it. I prefer staying under the radar, with slightly wonky looking equity curves which increase nevertheless over time. Trading multiple strategies like this is preferable to a single strategy. I maintain that 5 to 10 percent per year, per strategy, with a handful of strategies is the right starting point for people who are serious about trading. Contrary to popular belief, FX can be profitable, but the right sort of strategies have to be applied to it. The motor can be fine tuned once the comprehension of the markets is there. The possibilities are endless, to mix and match types of strategies, pairs and time-frames. The Momentum 4.23 is a great place to start as it trades strong momentum moves and this is what Forex is all about. What About Brokers Which One Do You Recommend? Choosing the right broker can be a minefield for the uniniiated. I have found that true ECN broker IC Markets are about as good as you get when you balance costs against service. They provide us with a rebate so we pay 5.5 instead 7 per million. They are currently GMT+3 and you can set your EA up as I set mine up as I also trade with them. How about VPS machines ? It is important to get at the front of queue what ever your trade size and whatever your trading strategy. Using a good VPS machine will help you in this respect. Make sure you select the correct machine located right newt to your brokers machine. CNS can help with this as they are experts in Forex VPS machines. Be sure to check out their latency chart here. Note: this version runs on EUR/USD four hour timeframe only. EXACT TRADING BVBA ("Company") is not an investment advisory service, nor a registered investment advizor or broker-dealer and does not purport to tell or suggest which securities or currencies customers should buy or sell for themselves. The analysts and employees or affiliates of Company may hold positions in the stocks, currencies or industries discussed here. You understand and acknowledge that there is a very high degree of risk involved in trading securities and/or currencies. The Company, the authors, the publisher, and all affiliates of Company assume no responsibility or liability for your trading and investment results. Factual statements on the Company's website, or in its publications, are made as of the date stated and are subject to change without notice.It should not be assumed that the methods, techniques, or indicators presented in these products will be profitable or that they will not result in losses. Past results of any individual trader or trading system published by Company are not indicative of future returns by that trader or system, and are not indicative of future returns which be realized by you. In addition, the indicators, strategies, columns, articles and all other features of Company's products (collectively, the "Information") are provided for informational and educational purposes only and should not be construed as investment advice. Examples presented on Company's website are for educational purposes only. Such set-ups are not solicitations of any order to buy or sell. Accordingly, you should not rely solely on the Information in making any investment. Rather, you should use the Information only as a starting point for doing additional independent research in order to allow you to form your own opinion regarding investments. You should always check with your licensed financial advisor and tax advisor to determine the suitability of any investment.